Adult acquired flatfoot deformity (AAFD) is a painful, chronic condition found most often in women between the ages of 40 and 60. AAFD occurs when the soft tissues of the foot are overstretched and torn, causing the arch to collapse. Flatfoot deformities may also be caused by a foot fracture, or may result from long-term arthritis. Once the posterior tibial tendon-the tendon unit that holds up the arch-loses its function, the foot becomes flat as the bones spread out of position during weight bearing. Without an AAFD repair, the condition may progress until the affected foot becomes entirely rigid and quite painful. Posterior tibial tendon dysfunction is the most common cause of acquired adult flatfoot deformity. There is often no specific event that starts the problem, such as a sudden tendon injury. More commonly, the tendon becomes injured from cumulative wear and tear. Posterior tibial tendon dysfunction occurs more commonly in patients who already have a flat foot for other reasons. As the arch flattens, more stress is placed on the posterior tibial tendon and also on the ligaments on the inside of the foot and ankle. The result is a progressive disorder. The history and physical examination are probably the most important tools the physician uses to diagnose this problem. The wear pattern on your shoes can offer some helpful clues. Muscle testing helps identify any areas of weakness or muscle impairment. This should be done in both the weight bearing and nonweight bearing positions. A very effective test is the single heel raise. You will be asked to stand on one foot and rise up on your toes. You should be able to lift your heel off the ground easily while keeping the calcaneus (heel bone) in the middle with slight inversion (turned inward). X-rays are often used to study the position, shape, and alignment of the bones in the feet and ankles. Magnetic resonance (MR) imaging is the imaging modality of choice for evaluating the posterior tibial tendon and spring ligament complex. Medical or nonoperative therapy for posterior tibial tendon dysfunction involves rest, immobilization, nonsteroidal anti-inflammatory medication, physical therapy, orthotics, and bracing. This treatment is especially attractive for patients who are elderly, who place low demands on the tendon, and who may have underlying medical problems that preclude operative intervention. During stage 1 posterior tibial tendon dysfunction, pain, rather than deformity, predominates. Cast immobilization is indicated for acute tenosynovitis of the posterior tibial tendon or for patients whose main presenting feature is chronic pain along the tendon sheath. A well-molded short leg walking cast or removable cast boot should be used for 6-8 weeks. Weight bearing is permitted if the patient is able to ambulate without pain. If improvement is noted, the patient then may be placed in custom full-length semirigid orthotics. The patient may then be referred to physical therapy for stretching of the Achilles tendon and strengthening of the posterior tibial tendon. Steroid injection into the posterior tibial tendon sheath is not recommended due to the possibility of causing a tendon rupture. In stage 2 dysfunction, a painful flexible deformity develops, and more control of hindfoot motion is required. In these cases, a rigid University of California at Berkley (UCBL) orthosis or short articulated ankle-foot orthosis (AFO) is indicated. Once a rigid flatfoot deformity develops, as in stage 3 or 4, bracing is extended above the ankle with a molded AFO, double upright brace, or patellar-tendon-bearing brace. The goals of this treatment are to accommodate the deformity, prevent or slow further collapse, and improve walking ability by transferring load to the proximal leg away from the collapsed medial midfoot and heel. What Are The Key Treatments And Causes Of Achilles Tendinitis Pains ? Achilles Tendinitis is the inflammation of the Achilles Tendon located in the heel, and is typically caused by overuse of the affected limb. Most often, it occurs in athletes who are not training with the proper techniques and/or equipment. When the Achilles Tendon is injured, blood vessels and nerve fibers from surrounding areas migrate into the tendon, and the nerve fibers may be responsible for the discomfort. Healing is often slow in this area due to the comparably low amount of cellular activity and blood flowing through the area. The cause of paratenonitis is not well understood although there is a correlation with a recent increase in the intensity of running or jumping workouts. It can be associated with repetitive activities which overload the tendon structure, postural problems such as flatfoot or high-arched foot, or footwear and training issues such as running on uneven or excessively hard ground or running on slanted surfaces. Tendinosis is also associated with the aging process. Achilles tendonitis and tendinopathy present as pain in the Achilles tendon, usually several centimeters above where it inserts on the heel. In some patients, pain and tendon damage are primarily at the insertion to the heel bone. There may be swelling and/or thickening of the tendon. Bending at the ankle, walking, jumping, and running are often painful with this condition. Treatment will depend on the severity of the injury. In general terms, the longer the symptoms are present before treatment begins, the longer the timeframe until complete recovery is achieved. Complete recovery can take between three and nine months. 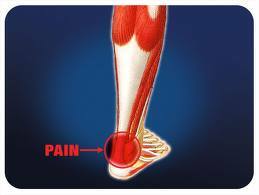 Initial treatment of Achilles tendonitis includes, Rest, to avoid further injury to the area. Ice, to reduce inflammation, Elevation, to reduce swelling. Bandaging or strapping, to support the area and restrict movement of the tendon. Anti-inflammatory medications to reduce pain and inflammation. (Cortisone (steroid) injections to reduce inflammation are not usually recommended as they may weaken the tendon and increase the risk of rupture). Other treatments include, Physiotherapy, Physiotherapy plays an important role in the treatment of Achilles tendonitis. This generally focuses on two main areas – treatment and rehabilitation. Treatment may involve such techniques as massage, ultrasound, acupuncture and gentle stretching. Rehabilitation involves the development of an individualised recovery programme, the most important aspect of which is strengthening. Strengthening of the muscles surrounding the Achilles tendon helps to promote healing in the tendon itself. Strengthening is achieved through the use of specific exercises, which will be taught by the physiotherapist. One such exercise is eccentric loading, which involves contracting the calf muscle while it is being stretched. It is common for the rehabilitation programme to take up to three months. Podiatry, including gait analysis and the fitting of orthotic devices to support the foot and reduce stress on the tendon, may be recommended. For cases of Achilles tendonitis that do not respond to initial treatment, casting or splinting of the affected foot may be recommended to allow it to rest completely. Surgery for an acute Achilles tendon tear is seemingly straightforward. The ends of the torn tendon are surgically exposed and sutures are used to tie the ends together. The sutures used to tie together the torn tendon ends are thick and strong, and are woven into the Achilles both above and below the tear. While the concepts of surgery are straightforward, the execution is more complex. Care must be taken to ensure the tendon is repaired with the proper tension — not too tight or too loose. The skin must be taken care of, as excessive handling of the soft tissues can cause severe problems including infection and skin necrosis. Nerves are located just adjacent to the tendon, and must be protected to prevent nerve injury. If surgery is decided upon, it is usually performed within days or weeks of the injury. The idea is to perform the repair before scar tissue has formed, which would make the repair more difficult. Some surgeons may recommend delaying surgery a few days from the initial injury to allow swelling to subside before proceeding with the repair.